Find a printable string that the program would print ultimately. 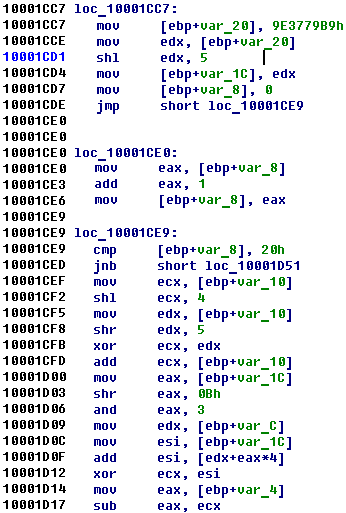 The program is packed PE x86 executable file (dll). The packer was easy, and it took few minute to get a unpacked file (PE tools + ImpRec). The program consists of a lot of functions, but the most of them are not interesting for us. 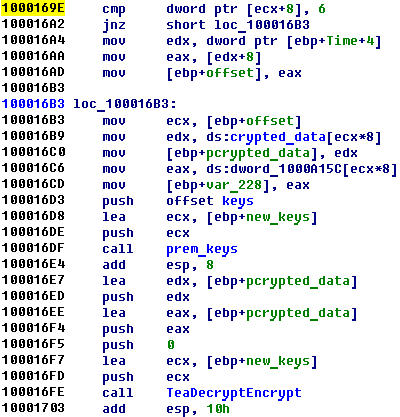 How you can guess “TeaDecryptEncrypt” function is my favorite and adored XTEA crypto function. It consists of encrypt and decrypt function, but we are interested in only decrypt one. Thanks for the writeup guys, but FYI you could find the XTEA implementation used by YUT (pretty sure of that) here : http://polarssl.org/trac/browser/trunk/library/xtea.c .